The majority of hiking we do is on our river journeys, as most of the rivers we travel have fantastic hiking terrain accessible right from the river. We do however offer the occasional trip focused on hiking, and we can put together hiking itineraries. These are not specifically backpacking trips, but involve day hiking from a base that is accessible by road or float plane, or a short backpack into a camp which we will base out of. Below are examples of hiking trips that we offer as custom-designed journeys for ready made groups of family and friends. We can tailor make any trip to suit the needs and desires of your group, so if you do not find what you are looking for in our offerings listed below please inquire with us. 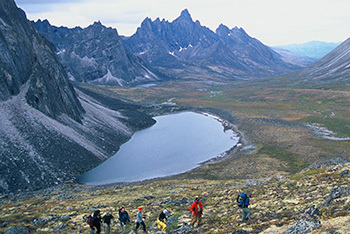 We operate throughout the Yukon territory, and can offer journeys of any length. Keep in mind that Sila also specializes in sojourns which have a creative or personal development focus (for eg, photography, writing, art, yoga, meditation, etc) . View our scheduled departures for 2014 to see if any of these hiking trips are currently being offered for general sign up this coming season. And keep on mind that we may post more scheduled trips closer to the summer.